E-mail marketing is still one of the best sales-channels in online marketing, have you started? Try our easy tools to create stunning newsletters, converting popups, and grow your revenue today. Our platform have some of the most advanced and userfriendly drag n´ drop editors. 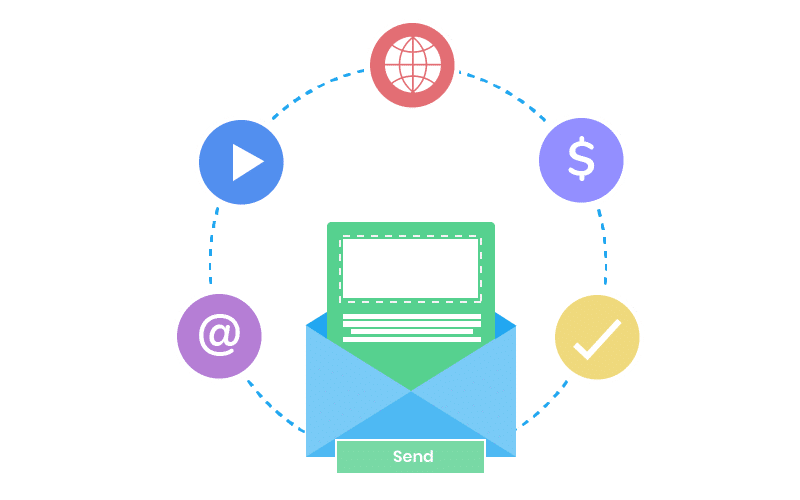 Our newsletter editor is easy to use, and requires no technical knowledge to create amazing mobile friendly newsletters, that can grow your revenue today. Our platform have some of the most advanced and user friendly drag n´ drop editors giving you full control over your email marketing content. Our newsletter editor is easy to use, and requires no technical knowledge to create amazing mobile friendly newsletters, that can grow your revenue today. You may want to inform everyone of an event, important information or special offers. Send one-time emails instantly to your entire list. Schedule emails and newsletters for a specific date and time to reach maximum reach and interactions. No need for you to push the button. Send personalized and segmented emails to parts of your list, and reach higher interaction rates. Respond right away with automated email responders. Send thank you emails, welcome emails or deliver lead magnets automatically. Send multiple versions of your email to your list, in order to find out which one is giving you the best interactions. Split testing emails is a great way to optimize your email marketing. Send more personal emails with dynamic content, by using the information you already have on your contact. Send personal birthday emails, offers and much more. Your website recieves a lot of visitors which doesnt directly results in a sale or contact request. That doesnt mean they arent interested in your product, and they may still be interested in learning more. 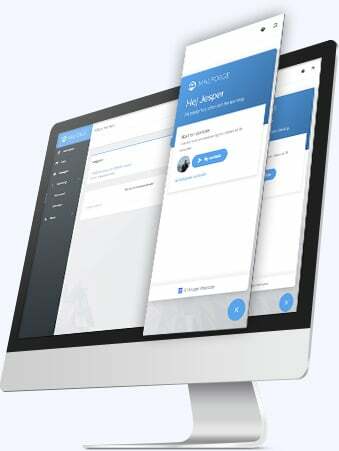 Thats why we have created a lead generation tools, from which you can create the most stunning and user friendly popups, landing pages or sign up forms, that you can embed directly on your website. 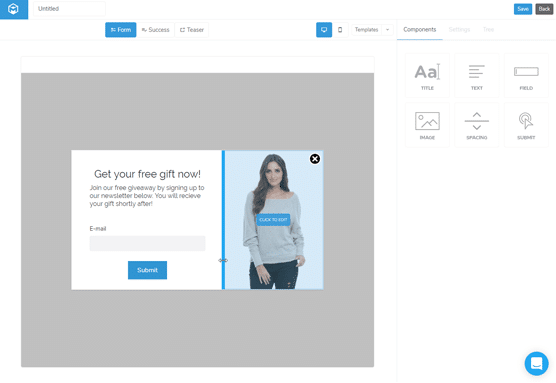 Use our drag n´ drop popup editor to make professional looking popups that looks great on any device, or tease with catching CTA triggers that opens a sign up form. Embed sign up forms in the footer of your website, inside your content or in your landing pages. This is a great way for passive lead generation. Even without a website, you can generate leads by sharing links to our hosted pages, or by creating stunning landing pages hosted on our platform. 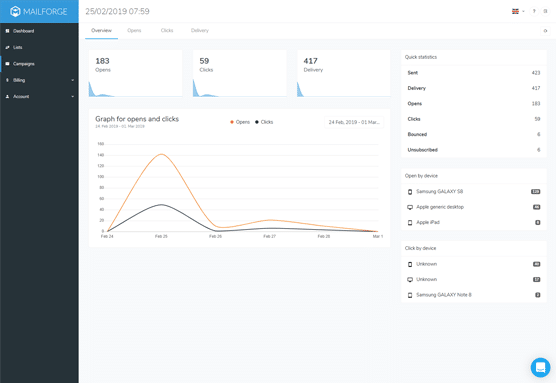 Our reports of your sent newsletters, gives you a quick overview over deliveries, opens and interactions with your newsletter. You can even see what content your contacts interacts with, which devices, browsers and operation systems they use. Understanding your contacts interactions with your newsletter, gives you better and more effective oppertunities to optimize your future newsletter campaigns even more. Experience the amazing feeling, when seeing your contacts interact with your newsletter in real-time. You also gets a graph that shows when your newsletter is opened and clicked which gives you tips for when to schedule your next newsletter. You get a good overview on which devices your contacts opens you newsletter from, or if their on Android or IOS. This will help you target your newsletters exactly towards the right segment, and reach more conversions. Use our detailed click overview, to better understand what your contacts interest´s are, to raise conversions even more. By knowing what links that catches people´s attention, you can optimize your next newsletter to perfection. 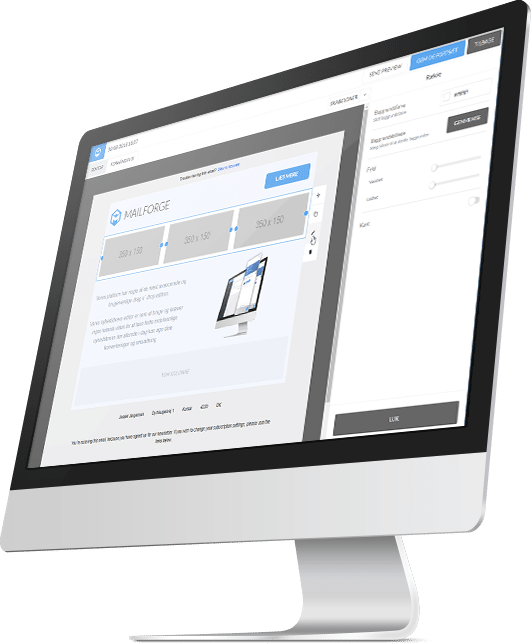 Mailforge offers powerful and detailed insights into your marketing campaigns, making them more profitable and more personal. You can get in touch with us at any time within our application, with any questions or feedback, making your experience and our platform better. Get in touch with us with any questions you may have trough our integrated chat system. Both you and our supporters, always have access to previous conversations, giving you a much more personal and effective support session. Support is available in both Danish and English.